Name Variation August Herman Niemann was also known as Herman. Name Variation August Herman Niemann was also known as Carl Hermann August Christian Nieman. Name Variation August Herman Niemann was also known as Nieman. August Herman Niemann was born on 17 March 1870 at Varendorf, Hanover, Germany. He was the son of Heinrich Christian Nieman and Catharine Dorothee Margarethe Schliekau. August Herman Niemann married Lena A. (?) circa 1897. August Herman Niemann died on 12 April 1960 at Milwaukee, Milwaukee, Wisconsin, at age 90. Port of Departure: Hamburg, Germany. August Herman Niemann was a machinist in 1900. 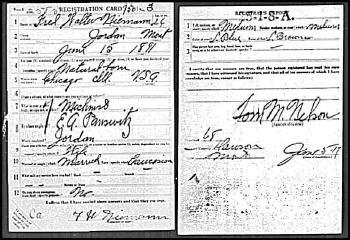 [S245] U.S. Federal Census 1900 U.S. Federal Census, by Ancestry.com, Year: 1900; Census Place: Milwaukee Ward 12, Milwaukee, Wisconsin; Roll: T623_1803; Page: 5A; Enumeration District: 106. [S244] U.S. Federal Census 1910 U.S. Federal Census, by Ancestry.com, Year: 1910; Census Place: Milwaukee Ward 12, Milwaukee, Wisconsin; Roll: T624_1725; Page: 10B; Enumeration District: 0123; FHL microfilm: 1375738. [S243] U.S. Federal Census 1920 U.S. Federal Census, by Ancestry.com, Year: 1920; Census Place: Milwaukee Ward 12, Milwaukee, Wisconsin; Roll: T625_2002; Page: 8A; Enumeration District: 153; Image: 342. Emma Niemann was born at Wisconsin on 11 July 1872. She was the daughter of Heinrich Christian Nieman and Catharine Dorothee Margarethe Schliekau. Name Variation Christian Henry Niemann was also known as Heinrich Christian. Name Variation Christian Henry Niemann was also known as Nieman. Name Variation Christian Henry Niemann was also known as Chris. Name Variation Christian Henry Niemann was also known as Henry Christian. Christian Henry Niemann was born on 12 July 1854 at Hanover, Germany, also reported as 12 July 1855. Christian Henry Niemann married Katie Hahn, daughter of Johann Juergen Hahn and Dorothea Elisabeth Kohlmeier, on 2 November 1879 at St John Lutheran Church, Reedsburg, Sauk, Wisconsin. Christian Henry Niemann married Dorothea M. Kladt, daughter of August Heinrich Kladt and Maria Elisabeth (? ), on 23 March 1881 at St John Lutheran Church, Reedsburg, Sauk, Wsconsin. Christian Henry Niemann died on 30 January 1930 at Vader, Lewis, Washington, at age 75. He was buried after 30 January 1930 at Little Falls Cemetery, Vader, Lewis, Washington. 1900 Little Falls, Lewis, Washington He was listed as the head of a family on the 1900 Census at Little Falls, Lewis, Washington. 1920 Vader, Lewis, Washington He was listed as the head of a family on the 1920 Census at Vader, Lewis, Washington, living next door to Ernest Niemann. Port of Departure: Hamburg, Germany. In 1880 CHRISTIAN NIEMANN, farmer, Sec. 23; P. O. Reedsburg; born in Hanover, Germany, July 12, 1855; he received his education in Germany, and came to America and direct to Reedsburg in 1870; in 1875, he went to Washington Territory and remained for three and a half years; returning to Reedsburg, he settled on his present place in the fall of 1879. Nov. 2, 1879, he was married to Miss Katie Hahn, who was born in Hanover, Germany, Oct, 29, 1861, and emigrated to Westfield, Wis. in 1867. NOTE: According to John Laverne Niemann Jr, Christian Niemann of Reedsburg is not related to his family.2 Christian Henry Niemann was living circa 1918 at Washington. Name Variation Katie Hahn was also known as Catherine. Name Variation Katie Hahn was also known as Katherine. Name Variation Katie Hahn was also known as Anna Christine. Name Variation Katie Hahn was also known as Kate. 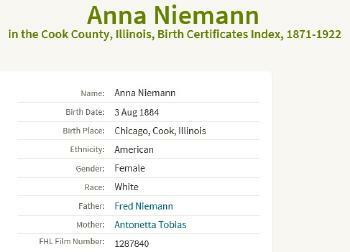 Married Name 2 November 1879 As of 2 November 1879,her married name was Niemann. Katie Hahn was born at Hanover, Germany, on 29 October 1861. Katie Hahn married Christian Henry Niemann, son of Jurgen Heinrich Nieman and Catherine Dorothea Kohlmeier, on 2 November 1879 at St John Lutheran Church, Reedsburg, Sauk, Wisconsin. Katie Hahn died on 26 November 1880, at age 19. 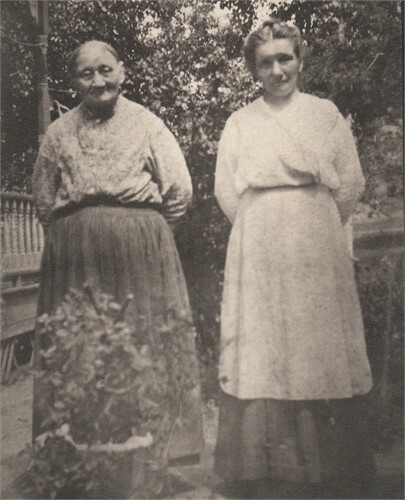 Katie Hahn immigrated with Johann Juergen Hahn and Dorothea Elisabeth Kohlmeier in 1867 at Westfield, Wisconsin. [S273] Wisconsin Sauk County, Wisconsin Cemetery Records, page 96. Peter Byrne was born on 12 November 1847 at Ireland also reported as Sep 1846. He was the son of John Byrne and Bridget Royal. 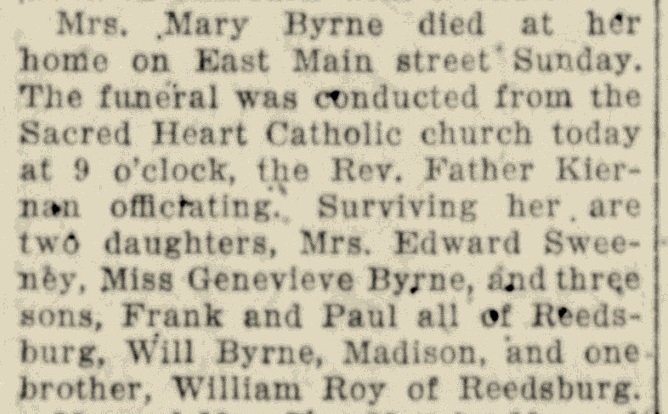 Peter Byrne married Mary Ellen Ray, circa 1877. 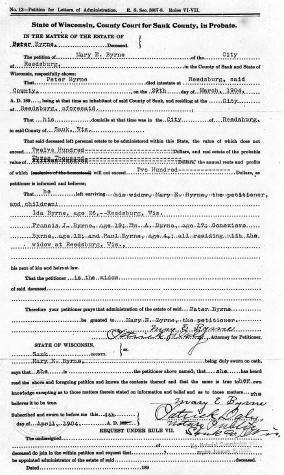 His estate was probated on 5 April 1904 at Sauk, Wisconsin. John Byrne witnessed the migration in 1859 at Ohio to, Wisconsin; in a trip made by wagon. In 1900 Reedsburg city leader.9 Peter Byrne was a grain buyer in 1900. [S273] Wisconsin Sauk County, Wisconsin Cemetery Records, page 132. [S247] U.S. Federal Census 1870 U.S. Federal Census, by Ancestry.com, Page 3. Stamp 221. Dwelling 20. Ida C. 2 dau b.Ireland b.Ireland b.Ireland. [S215] Sesquicentennial History Committee, Reedsburg Remembers 150 Years, Page 49. Name Variation Mary Ellen Ray was also known as Nellie Mary. 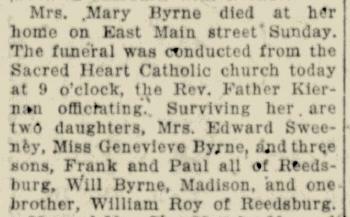 Married Name circa 1877 As of circa 1877,her married name was Byrne. Mary Ellen Ray was born on 16 March 1853 at Wisconsin also reported as Mar 1855. 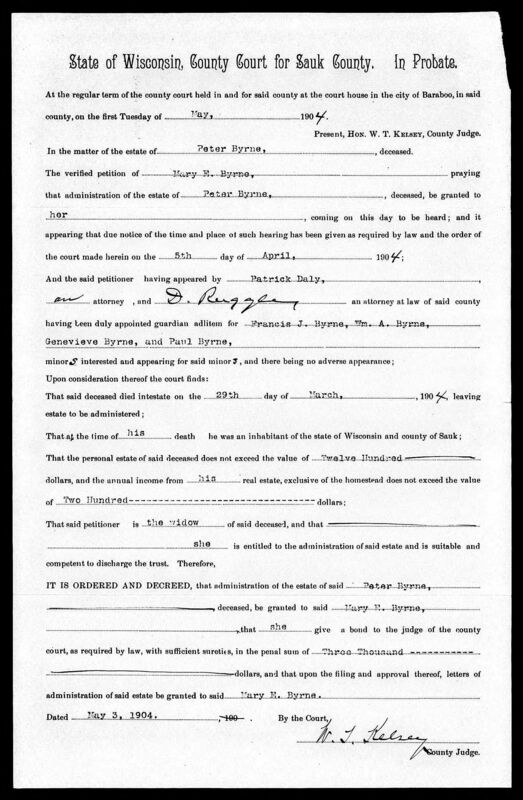 She was listed as a beneficiary in Peter Byrne's will on 5 April 1904 at Sauk, Wisconsin. Mary Ellen Ray died on 16 May 1926 at age 73 Mary (Ray) Byrne obituary. 1 June 1905 Reedsburg, Sauk, Wisconsin Mary Ellen Ray appeared on the census of 1 June 1905 at Reedsburg, Sauk, Wisconsin. 19 April 1910 Reedsburg City, Sauk, Wisconsin She was listed as the head of a family on the 1910 Census at Reedsburg City, Sauk, Wisconsin. Married Name between 1910 and 1914 As of between 1910 and 1914,her married name was Sweeney. Ida C. Byrne was born at Wisconsin in February 1878. Ida C. Byrne married Edward L. Sweeney between 1910 and 1914. Ida C. Byrne died on 21 March 1939 at age 61. 1 June 1905 Reedsburg, Sauk, Wisconsin Ida C. Byrne appeared on the census of 1 June 1905 in the household of Mary Ellen Ray at Reedsburg, Sauk, Wisconsin. 19 April 1910 Reedsburg City, Sauk, Wisconsin Ida C. Byrne was listed as a daughter in Mary Ellen Ray's household on the 1910 Census at Reedsburg City, Sauk, Wisconsin. Ida C. Byrne graduated in 1898 1897-1898 graduating class list from a yearbook called,"The Echo" for the Milwaukee Normal School states that Ida C. Byrne was from Reedsburg, Sauk County, Wisconsin. Normal School was a two year teacher's college in Milwaukee, Wisconsin. She was a schoolteacher in 1900. She was a public school instructor in 1910. Name Variation Henry Jurgen Friede was also known as John H. A. Name Variation Henry Jurgen Friede was also known as Johann Heinrich Adolf Friede. 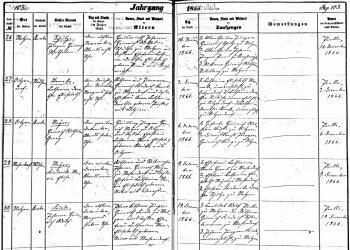 Name Variation Henry Jurgen Friede was also known as J. H.
Henry Jurgen Friede was born on 11 December 1866 at Molzen, Uelzen, Hanover, Germany, According to census records, Henry J. was born December 1867. Henry Jurgen Friede died on 2 September 1928 at age 61. 20 January 1920 Reedsburg, Sauk, Wisconsin He was listed as the head of a family on the 1920 Census at Reedsburg, Sauk, Wisconsin, Living at 295 Eighth Street. Ship Name: Moravia. Henry Jurgen Friede was naturalized in 1895.10 He was a laborer for the rail road in 1900 at Reedsburg, Sauk, Wisconsin. 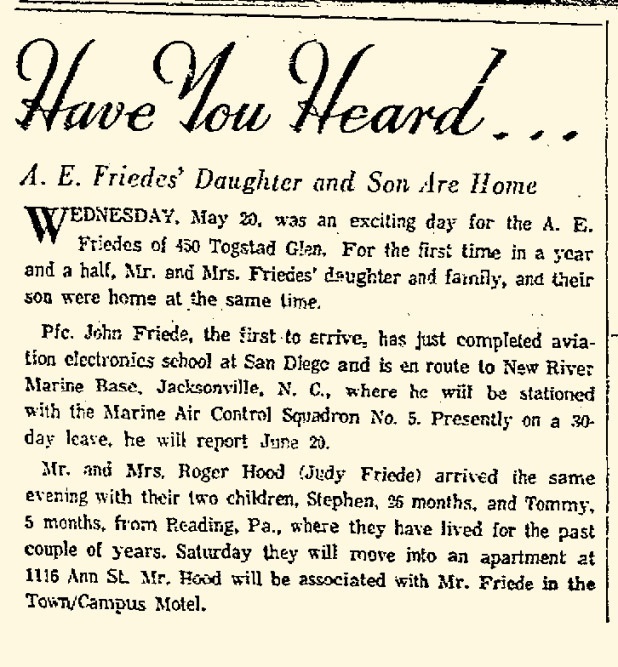 In September 1945 at Reedsburg, Sauk, Wisconsin, mentioned in article announcing special delivery of a lei of orchids from Hawaii to celebrate the birth of Johnny Friede, newborn son of Mr and Mrs A E Friede; and background on the name John Friede. [S407] Lutheran Church, German Lutheran Church Records 1500-1971, Page 103;103. Film number 470788. 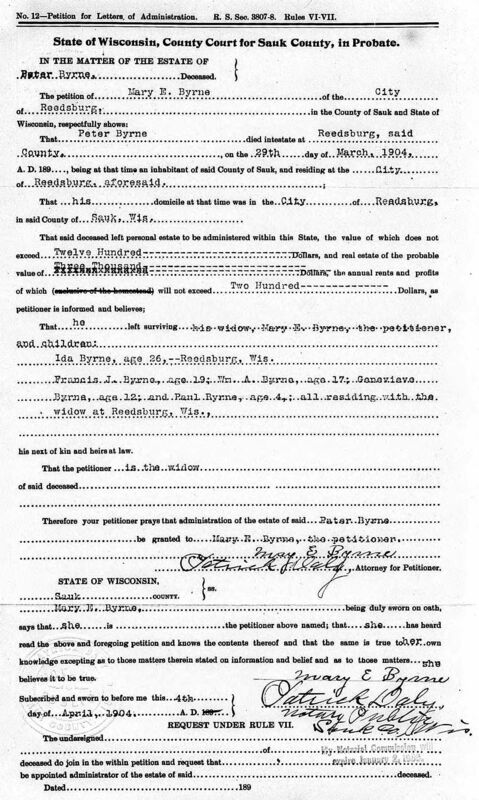 [S387] Family Search; Multiple Records, "Wisconsin Marriages, 1836-1930," database, FamilySearch (https://familysearch.org/ark:/61903/1:1:XRRY-GLZ : 4 December 2014), John H.W. Friede and Emma E. Goldmund, 29 Sep 1893; citing reference ; FHL microfilm 1,275,560. [S244] U.S. Federal Census 1910 U.S. Federal Census, by Ancestry.com, ED 123 Sheet 13A Sheet 12, line 21, family number 278. [S243] U.S. Federal Census 1920 U.S. Federal Census, by Ancestry.com, ED174. Stamp 178 line 7. Married Name 29 September 1893 As of 29 September 1893,her married name was Friede. Emma E. Goldmund was born on 10 June 1869 at Falkenwalde, Uckermark, Brandenburg, Germany, reported as St. Bremein B City Stethein. She was the daughter of Franz Goldmund and Mathilde Graeske. Emma E. Goldmund died on 22 October 1955 at Madison, Dane, Wisconsin, at age 86 Mrs Emma (Goldmund) Friede obituary. Emma E. Goldmund immigrated in 1886. She lived with Albert Adolph Steinweg and Mathilde Graeske in 1890 at Alt Leese, Pommerania, Germany. 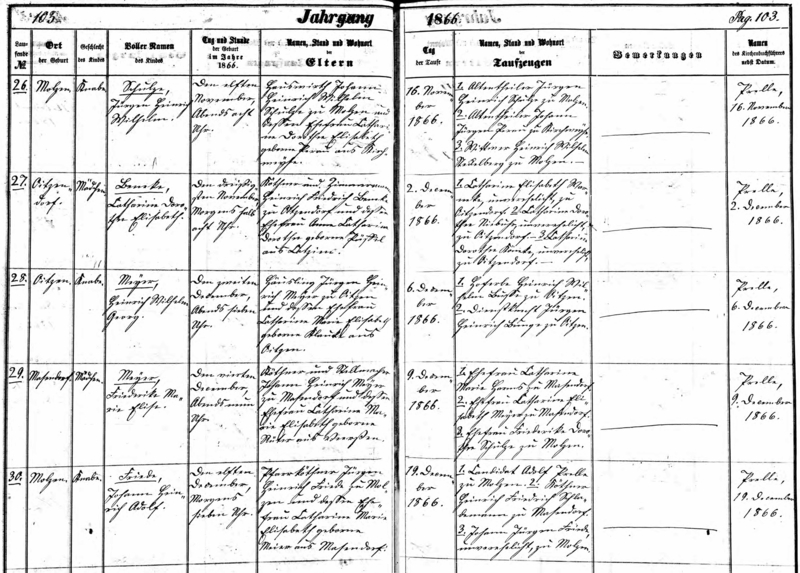 Emma E. Goldmund immigrated with Mathilde Graeske on 7 May 1890 at on ship Slavonia, New York, New York; traveling to Reedsburg, Wisconsin; port of departure Stettin and Swinemunde, Germany. Emma E. Goldmund had 7 with 5 living in 1910 children. She was a laundress at a steam laundry in 1930. 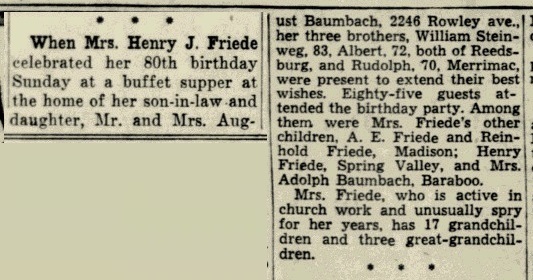 In June 1949 80th birthday celebration for Emma (Goldmund) Friede. In June 1955 86th birthday celebration for Emma (Goldmund) Friede at the home of daughter and son-in-law Emma and August Baumbach. [S250] U.S. Federal Census 1930 U.S. Federal Census, by Ancestry.com, ED13-48. Dwelling 38. [S373] U.S. Federal Census 1940 U.S. Federal Census, by Ancestry.com, Year: 1940; Census Place: Madison, Dane, Wisconsin; Roll: T627_4469; Page: 8A; Enumeration District: 13-45. Henry Albert Friede was born on 1 August 1894 at Reedsburg, Sauk, Wisconsin. 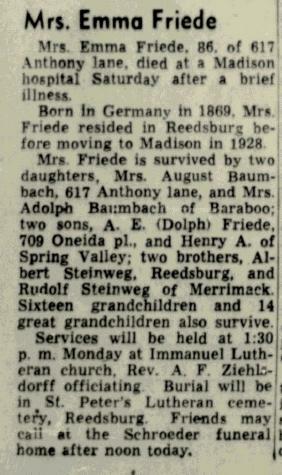 Henry Albert Friede married Hulda Meyer, daughter of Henry A. Meyer and Dorothea Pien, on 2 June 1920 at Reedsburg, Sauk, Wisconsin. 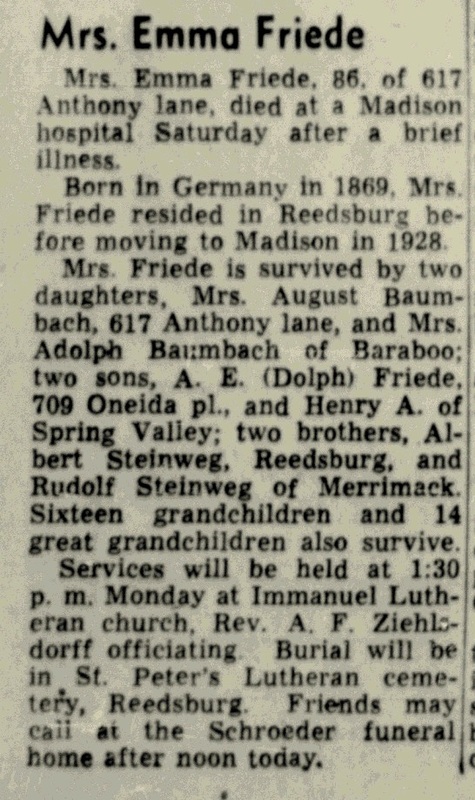 Henry Albert Friede and Hulda Meyer were divorced before 1940. Henry Albert Friede married Mary Hewitt, daughter of Clarence Otis Hewitt and Edna E. Gleason, on 1 August 1941. Henry Albert Friede died on 12 November 1978 at Menomonie, Wisconsin, at age 84 Henry Friede, 84, died at the American Lutheran Home in Menomonie. He married Hulda Meyer in 1920. He later married Mary Hewitt of Durand in 1941. He was a World War One veteran. He owned and operated Crystal Cave in Spring Valley for 17 years, retiring to Menomonie in 1959. He is survived by his wife; three sons, Orland of Eau Claire, Eldon of Blair and William of St. Paul, Minn; a brother Adolph of Madison, 7 grandchildren; two great-grandhildren. Burial in Evergreen cemetery. He was buried after 12 November 1978 at Evergreen Cemetery, Menomonie, Dunn, Wisconsin. 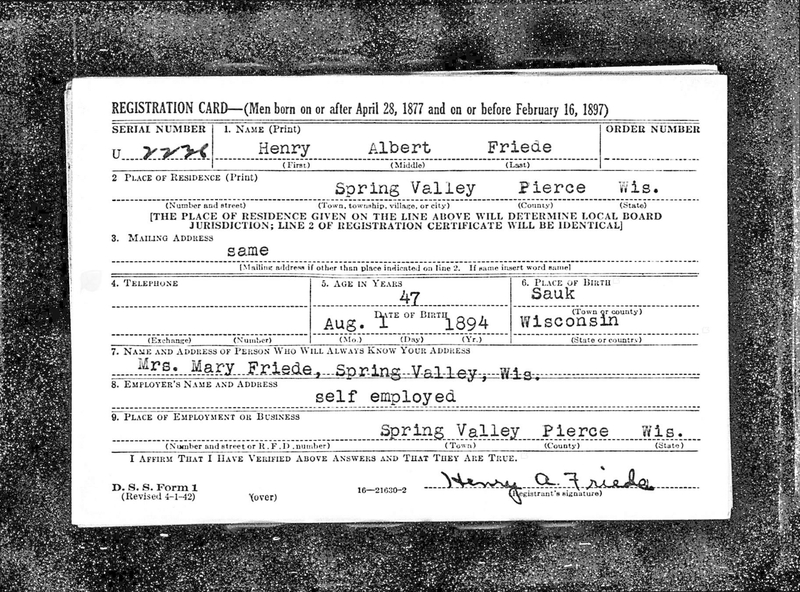 Henry Albert Friede obtained US Social Security Card at Wisconsin; last residence Menomonie, Dunn, Wisconsin. In 1942 at Spring Valley, Wisconsin, Crystal Cave at Spring Valley - Henry Albert (H A) Friede. 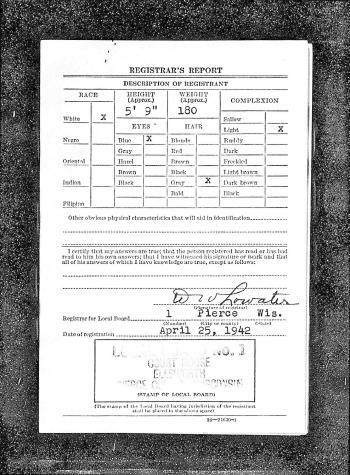 On 25 April 1942 at World War II Draft Registration, Spring Valley, Pierce, Wisconsin. In March 1943 A two-star service flag hanging in a window of the August Baumbach home, 1333 Milton st., is the same one Mrs. Emma Baumbach unfurled in World War I when her husband, August, and her brother, Henry Friede, went to war. The old service flag was brought out recently by Mrs. Baumbach when her second son, Robert, joined his brother, Harold, in the armed forces of the United States. Their father, commander of the Disabled American Veterans in Madison, and Friede both won the Purple Cross medal for service in the last war, and Baumbach also won a silver star award for bravery in action. Mrs. Baumbach is a past commander of the D. A. V. auxiliary here. In August 1960 at Menomonie, Wisconsin, Henry Friede has two bomb shelters in his home. Enough for his son's families, his wife and her relatives. [S250] U.S. Federal Census 1930 U.S. Federal Census, by Ancestry.com, ED17-24. Dwelling 23. Married Name circa 1918 As of circa 1918,her married name was Baumbach. 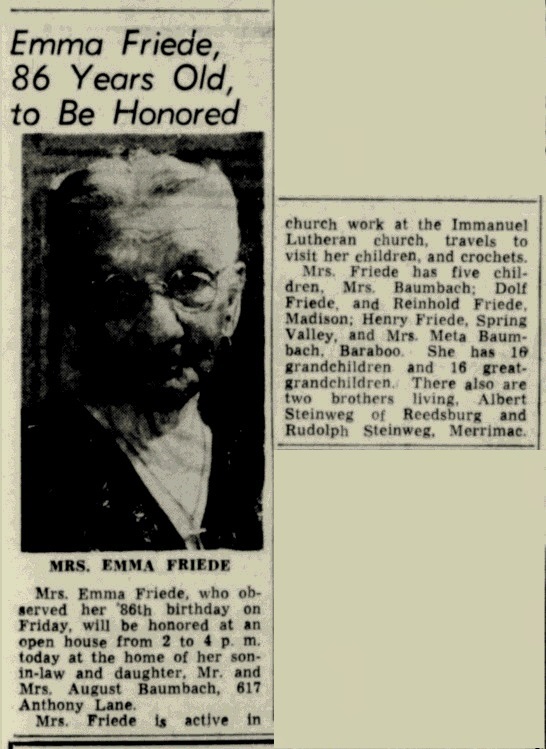 Emma L. Friede was born at Wisconsin on 4 December 1895. Emma L. Friede married August Albert Baumbach, son of William Baumbach and Bertha Maria Dorothea Schamens, circa 1918. 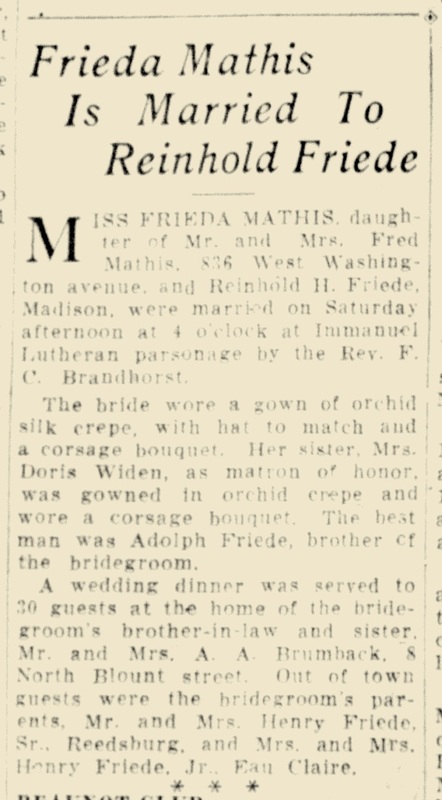 Emma L. Friede witnessed the marriage of Frieda E. Mathis and Reinhold Henry Herman Friede in August 1928; Frieda Mathis and Reinhold Friede marriage announcement. She was buried after 27 November 1965 at Roselawn Memorial Park, Monona, Dane, Wisconsin. Emma L. Friede obtained US Social Security Card at Wisconsin; last residence California. 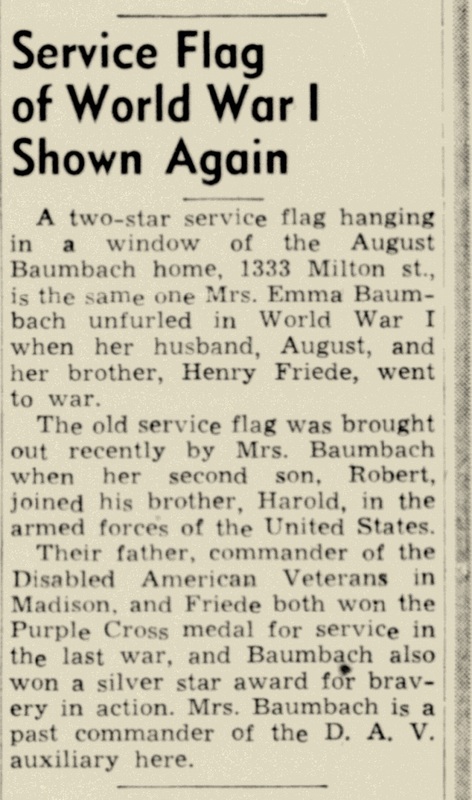 In March 1943 A two-star service flag hanging in a window of the August Baumbach home, 1333 Milton st., is the same one Mrs. Emma Baumbach unfurled in World War I when her husband, August, and her brother, Henry Friede, went to war. The old service flag was brought out recently by Mrs. Baumbach when her second son, Robert, joined his brother, Harold, in the armed forces of the United States. Their father, commander of the Disabled American Veterans in Madison, and Friede both won the Purple Cross medal for service in the last war, and Baumbach also won a silver star award for bravery in action. Mrs. Baumbach is a past commander of the D. A. V. auxiliary here. In September 1945 at Reedsburg, Sauk, Wisconsin, mentioned in article announcing special delivery of a lei of orchids from Hawaii to celebrate the birth of Johnny Friede, newborn son of Mr and Mrs A E Friede; and background on the name John Friede. In June 1949 80th birthday celebration for Emma (Goldmund) Friede. [S243] U.S. Federal Census 1920 U.S. Federal Census, by Ancestry.com, ED175. Dwelling 171. Name Variation Meta Anna Ida Friede was also known as Matie. Name Variation Meta Anna Ida Friede was also known as Martha. Married Name 1925 As of 1925,her married name was Baumbach. Meta Anna Ida Friede married Adolph Julius Baumbach, son of William Baumbach and Bertha Maria Dorothea Schamens, in 1925 Matie Friede and Adolph Baumbach engagement announcement. 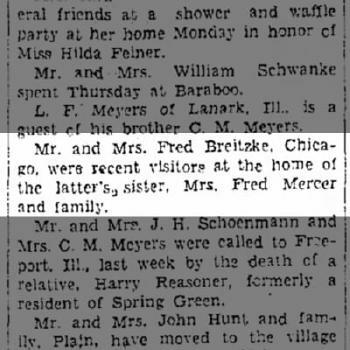 Meta Anna Ida Friede died on 9 June 1965 at Madison, Dane, Wisconsin, at age 64 Mrs. Meta Anna Baumbach, 64, of 59 Wilton Lane in Weathersfield, died Wednesday, June 9 in University Hospital in Madison, Wis., where she had been a patient for the past two weeks. Her age was 64. 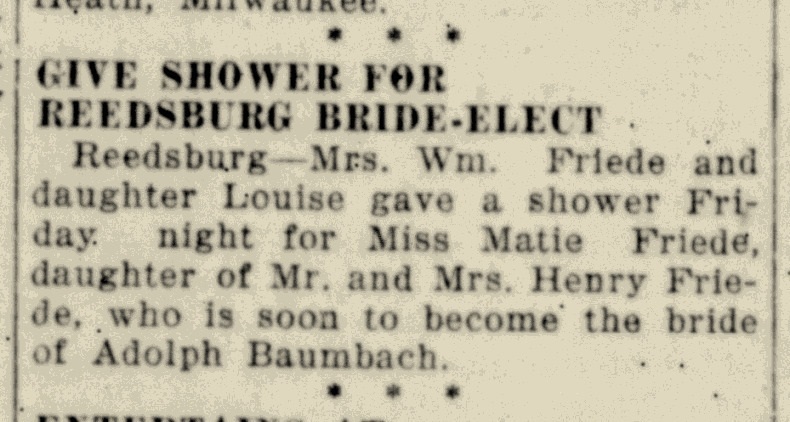 Mrs. Baumbach was born in Reedsburg, Wis., where she met and married J. Adolph Baumbach in 1925. Shortly thereafter they made their home in Baraboo, Wis. For the past two years she has lived with her daughter in Weathersfield. She was a member of St. Peter Lutheran Church, where services were held Friday, June 11, at 9 a.m., the Rev. John R. Sternberg officiating. Interment was at the church cemetery. 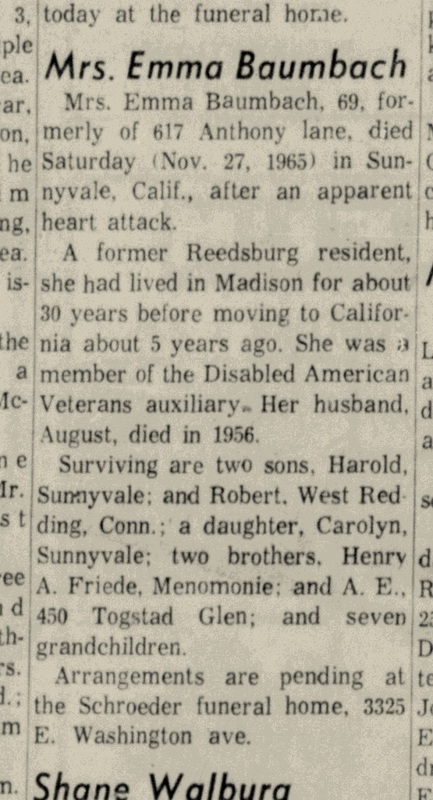 Surviving members of her family are two daughters, Mrs. Harlich Kohlmeyer, North Freedom, Wis., and Mrs. Audrey Ullery of Weathersfield; one son, Richard of Baraboo; seven grandchildren; brothers Adolph and Henry Friede of Wisconsin; and a sister, Mrs. Emma Baumbach of California. She was buried after 9 June 1965 at St. Peter's Lutheran Cemetery, Schaumburg, Cook, Illinois. 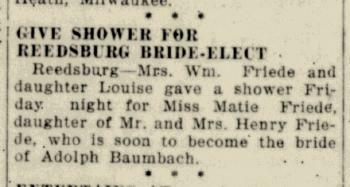 In March 1925 at Reedsburg, Sauk, Wisconsin, attended bridal shower hosted by Mrs William Friede and Louise Friede; hosted bridal shower for Matie Friede before her marriage to Adolph Baumbach. In September 1964 A fall resulted in the injury of Meta Baumbach, mother of Audrey Ullery, who was visiting at 59 Wilton Lane. Mrs. Baumbach will be hospitalized in Northwest Community Hospital for some time with a broken leg and bruises. Residents wish her a speedy recovery. 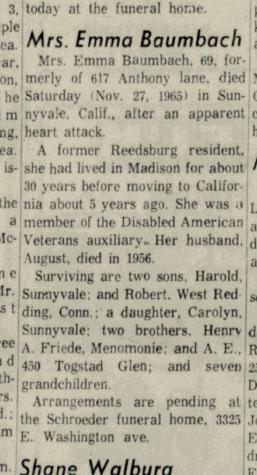 [S6] Wisconsin, Wisconsin Vital Record to 1907, Meta A Friede born 29 Jan 1901 Sauk County Reel 0265 Record 2181. [S250] U.S. Federal Census 1930 U.S. Federal Census, by Ancestry.com, ED56-2. Dwelling 399. [S373] U.S. Federal Census 1940 U.S. Federal Census, by Ancestry.com, Year: 1940; Census Place: Baraboo, Sauk, Wisconsin; Roll: T627_4523; Page: 12B; Enumeration District: 56-5. Name Variation Reinhold Henry Herman Friede was also known as R. H.
Reinhold Henry Herman Friede married Frieda E. Mathis, daughter of Frederick Mathis and Elizabeth Kuehni, in August 1928 Frieda Mathis and Reinhold Friede marriage announcement. 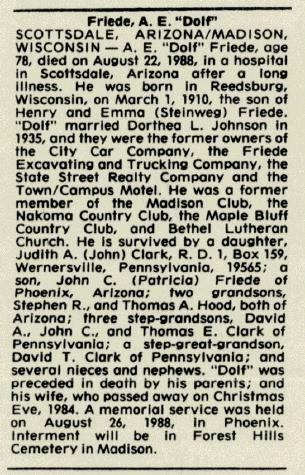 Reinhold Henry Herman Friede died on 4 July 1964 at age 62 Reinhold H Friede, 62, obituary. He was buried after 4 July 1964 at Sunset Memory Gardens, Madison, Dane, Wisconsin. Reinhold Henry Herman Friede obtained US Social Security Card at Wisconsin; last residence Wisconsin. 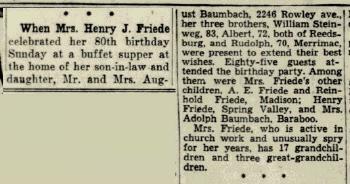 On 6 June 1928 Surprise party for Margaret Friede. 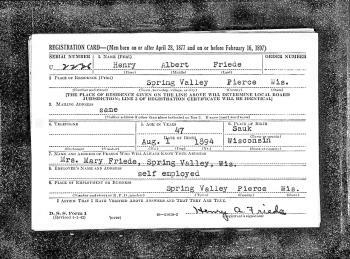 [S6] Wisconsin, Wisconsin Vital Record to 1907, Reinhold H Friede born 12 Feb 1902 Sauk County Reel 265 Record 2561. [S250] U.S. Federal Census 1930 U.S. Federal Census, by Ancestry.com, ED13-52. Dwelling 605. 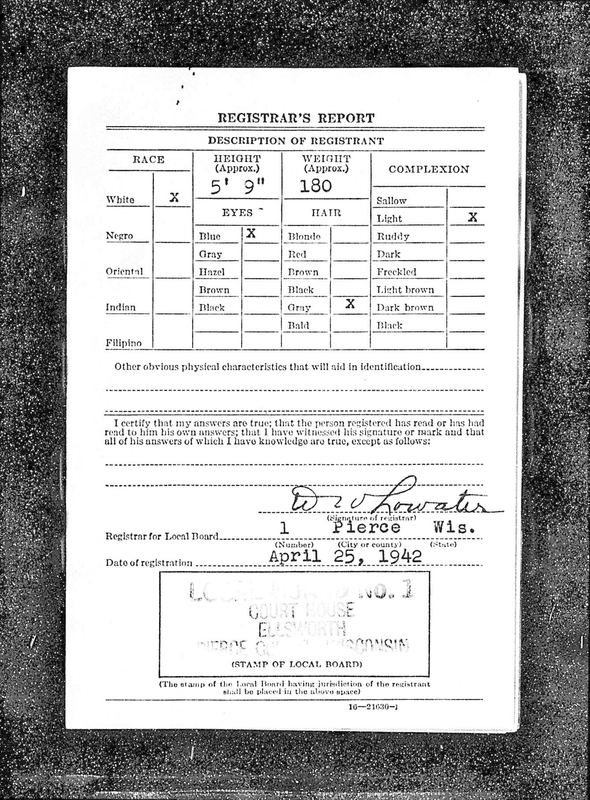 [S373] U.S. Federal Census 1940 U.S. Federal Census, by Ancestry.com, Year: 1940; Census Place: Madison, Dane, Wisconsin; Roll: T627_4470; Page: 12B; Enumeration District: 13-68. Name Variation Adolph E. Friede was also known as Dolf. Name Variation Adolph E. Friede was also known as Adolf E.
Name Variation Adolph E. Friede was also known as A. E.
Adolph E. Friede was born on 1 March 1910 at Reedsburg, Sauk, Wisconsin. 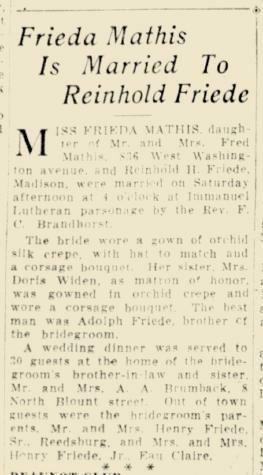 Adolph E. Friede was the best man at the wedding of Frieda E. Mathis and Reinhold Henry Herman Friede in August 1928; Frieda Mathis and Reinhold Friede marriage announcement. Adolph E. Friede married Dorothea Lois Johnson, daughter of Alfred B. Johnson and Winifred Ross, in 1935. 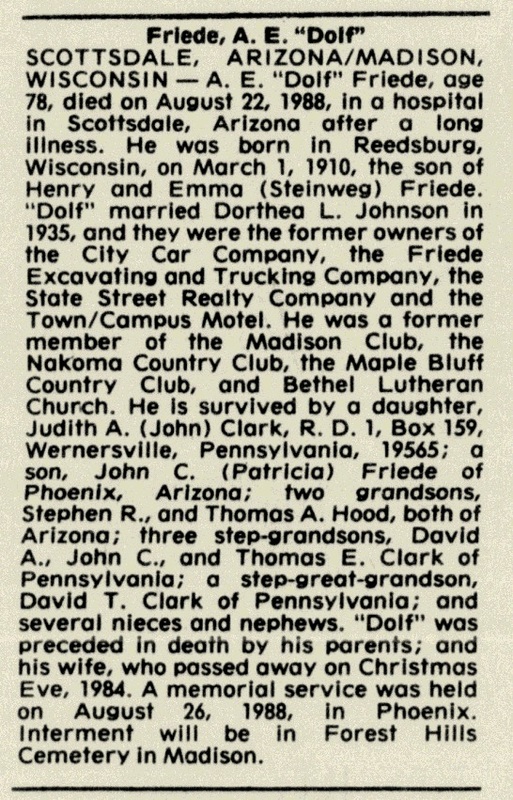 Adolph E. Friede died on 22 August 1988 at Scottsdale, Maricopa, Arizona, at age 78 Adolph E Friede obituary. He was buried on 16 September 1988 at Forest Hill Cemetery, Madison, Dane, Wisconsin, Plot: Section 20, Lot 051 C, Vault Cremation Urn. Adolph E. Friede obtained US Social Security Card at Wisconsin; last residence Scottsdale, Maricopa, Arizona. He graduated in 1928 at Reedsburg High School, Reedsburg, Sauk, Wisconsin. 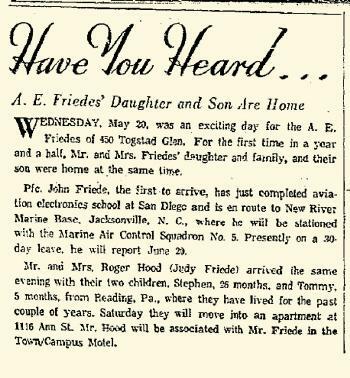 In September 1945 at Reedsburg, Sauk, Wisconsin, mentioned in article announcing special delivery of a lei of orchids from Hawaii to celebrate the birth of Johnny Friede, newborn son of Mr and Mrs A E Friede; and background on the name John Friede. On 10 June 1950 Members of Prospectors, Inc., including A. E. Friede who is helping fund the Yukon expedition. 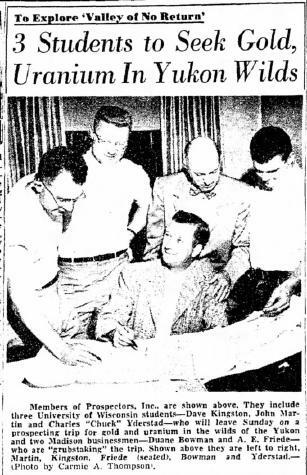 On 24 December 1961 Growth of lower State St. - A. E. (Dolf) Friede article. 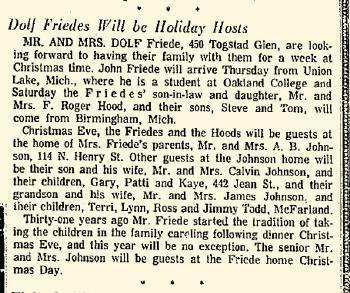 In May 1964 at Madison, Dane, Wisconsin, A E Friede visitors include son John and daughter's family, Mr and Mrs Roger Hood. 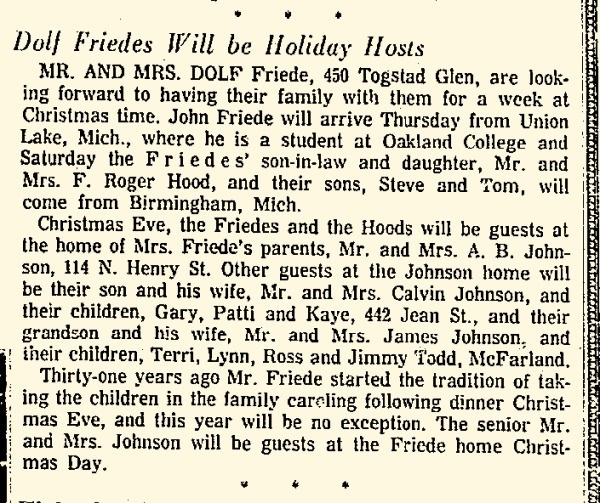 In December 1967 at Madison, Dane, Wisconsin, Dolf Friedes will be holiday hosts. [S373] U.S. Federal Census 1940 U.S. Federal Census, by Ancestry.com, Year: 1940; Census Place: Madison, Dane, Wisconsin; Roll: T627_4470; Page: 2A; Enumeration District: 13-64. Albert Tobias was the son of Frank Tobias and Anna (?). Albert Tobias died after 1930. Albert Tobias lived in 1930 at Chicago, Cook, Illinois. Name Variation Isabella Marie Niemann was also known as Isabell. Name Variation Isabella Marie Niemann was also known as Isabelle M.
Name Variation Isabella Marie Niemann was also known as Anna. Name Variation Isabella Marie Niemann was also known as Belle. Name Variation Isabella Marie Niemann was also known as Isabel M.
Isabella Marie Niemann was born on 3 August 1884 at Chicago, Cook, Illinois, also reported as 04 Aug 1883 and 03 Aug 1885. As of 1940, Isabella Marie Niemann was never married. She died on 4 August 1977 at Hernando, Florida, at age 93. She was a in 1922 at housekeeper. She lived in 1922 at 434 Islay St, San Luis Obispo, San Luis Obispo, California. On 27 July 1923 Bell Niemann visiting parents, Mr and Mrs C. F. Niemann. 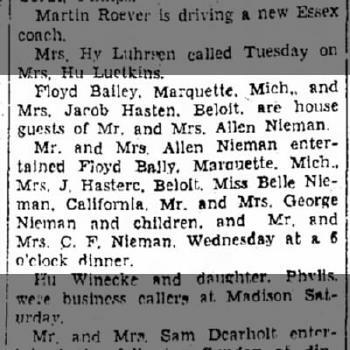 On 30 October 1929 Floyd Bailey, Marquette, Mich., and Mrs. Jacob Hasten, Beloit, are house guests of Mr. and Mrs. Allen Nieman. Mr. and Mrs. Allen Nieman entertained Floyd Baily, Marquette, Mich., Mrs. J. Hastere, Beloit, Miss Belle Nieman, California, Mr. and Mrs. George Nieman and children, and Mr. and Mrs. C. F. Nieman, Wednesday at a 6 o'clock dinner. 30 Oct 1929. She was a on 2 December 1930 at employed at Universal City, California. She lived in August 1936 at Los Angeles, California. She was a housework in 1940. She lived in 1940 at 3871 Lankershim Blvd, Los Angeles, California. She obtained US Social Security Card at California; last residence Brooksville, Hernando, Florida. [S373] U.S. Federal Census 1940 U.S. Federal Census, by Ancestry.com, Year: 1940; Census Place: Los Angeles, Los Angeles, California; Roll: T627_376; Page: 5B; Enumeration District: 60-53. 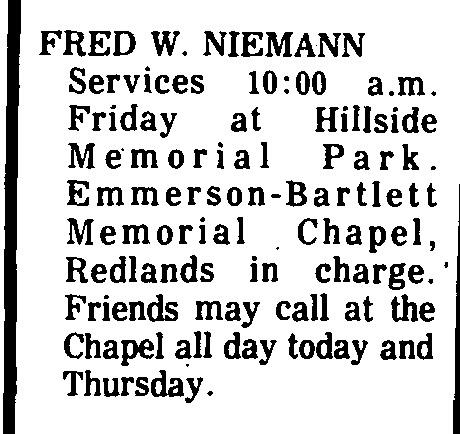 Name Variation Fred Walter Niemann was also known as Fredric. 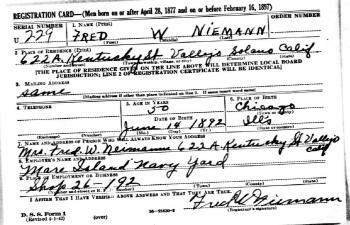 Fred Walter Niemann was born on 15 June 1890 at Chicago, Cook, Illinois, also reported as 15 Jun 1891; also reported as 14 Jun 1892; tombstone listed birth as 14 Jun 1889. Fred Walter Niemann married Margaret F. DeCamp, daughter of Silas Augustus DeCamp and Lavinia Elizabeth Anderson, on 23 August 1916 at 1st marriage for him; 2nd for her, Redfield, Dallas, Iowa, marriage record. 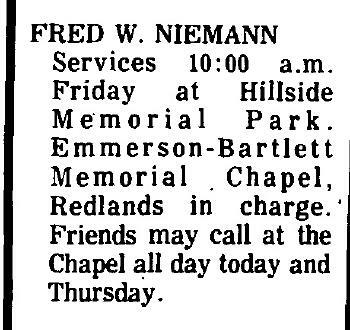 Fred Walter Niemann died on 18 August 1973 at San Bernardino, California, at age 83 birthplace listed as Massachusetts; Fred Walter Niemann obituary. 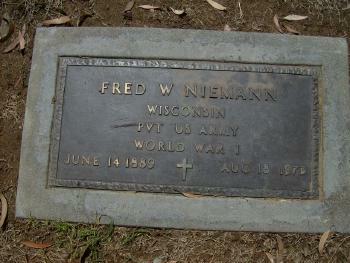 He was buried after 18 August 1973 at Hillside Memorial Park, Redlands, San Bernardino, California, WISCONSIN PRIVATE US ARMY WORLD WAR I.
Fred Walter Niemann obtained US Social Security Card at California; Redlands, San Bernardino, California. He lived in August 1916 at Billings, Montana, occupation: mechanic. He was a machinst with E. A. Panswitz in June 1917 at Jordan, Montana. 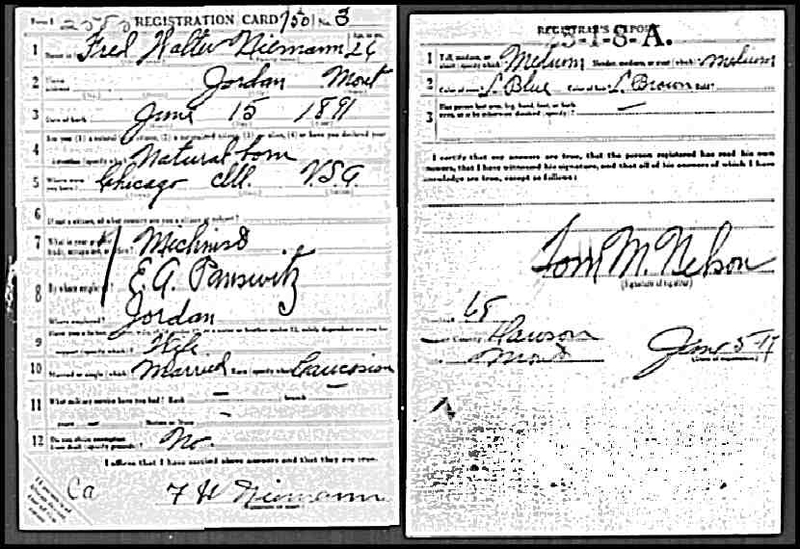 On 5 June 1917 at World War I Draft Registration, Dawson, Montana. He was a machinist at his own shop in 1920. He was a welder at steel factory in 1930. In August 1930 at Iowa Mr and Mrs Fred Niemann, son Eugene and Mrs S A DeCamp visited Mr and Mrs Roscoe Simons. He lived in August 1936 at Washington, D. C.. He was a in 1939 at mechanic. He lived in 1939 at 1337 Gough, San Francisco, California, listed as Republican. He was educated in 1940 completed 2 years of college. He was a Mare Island Navy Yard in 1942. In 1942 at U.S. World War II Draft Registration, Vallejo, Solano, California. 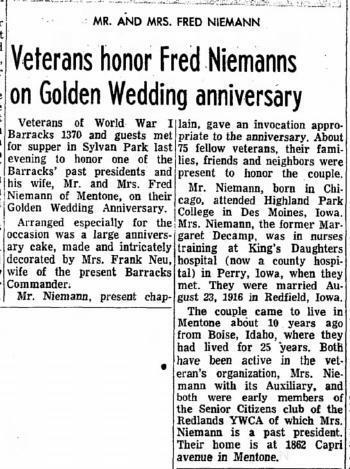 On 23 August 1966 at California Fred and Margaret Decamp Niemann 50th wedding annivesary article 26 Aug 1966 Redlands Daily Facts (Redlands, CA). [S243] U.S. Federal Census 1920 U.S. Federal Census, by Ancestry.com, ED268. Dwelling 22, 65. Sheet 3B. [S250] U.S. Federal Census 1930 U.S. Federal Census, by Ancestry.com, Year: 1930; Census Place: Huntington Park, Los Angeles, California; Roll: 171; Page: 3A; Enumeration District: 1318; Image: 676.0. [S373] U.S. Federal Census 1940 U.S. Federal Census, by Ancestry.com, Year: 1940; Census Place: San Francisco, San Francisco, California; Roll: T627_305; Page: 10B; Enumeration District: 38-193. Married Name before 1971 As of before 1971,her married name was Pauls. Married Name 13 October 1973 As of 13 October 1973,her married name was Lock. 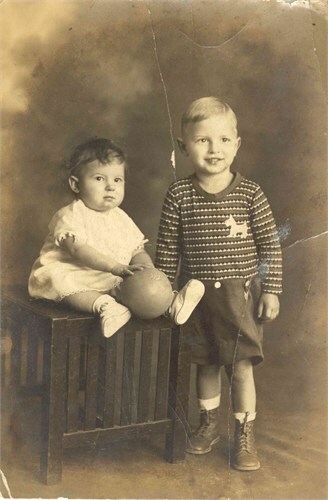 Edith Cecelia Niemann was born on 30 November 1921 at Franklin, Sauk, Wisconsin. She was the daughter of George Arthur Niemann and Cecelia K. Hutter. 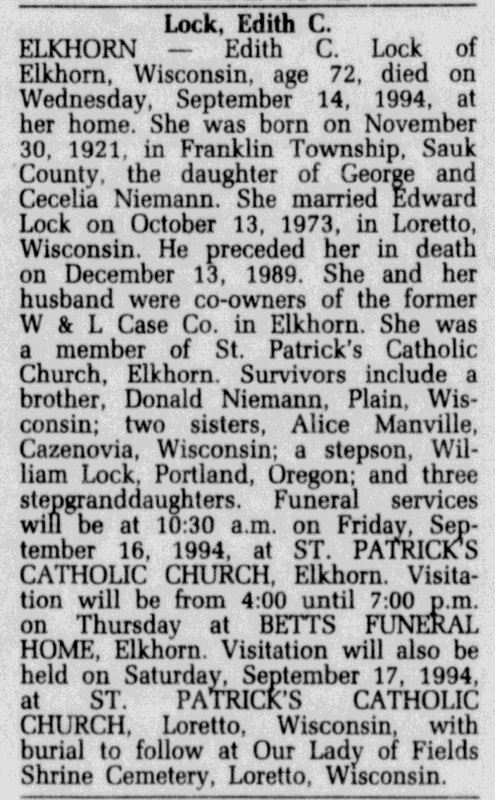 Edith Cecelia Niemann married (?) Pauls before 1971. 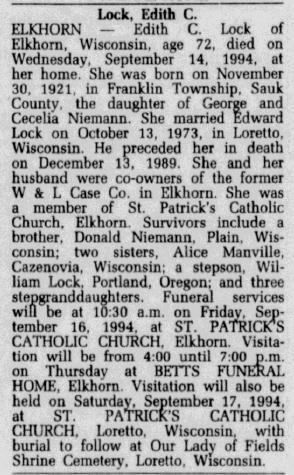 Edith Cecelia Niemann married Edward William Lock on 13 October 1973 at Sauk, Wisconsin. Edith Cecelia Niemann died on 14 September 1994 at Walworth, Wisconsin, at age 72 Edith Cecelia (Niemann) Lock obituary. She was buried after 14 September 1994 at Our Lady of the Fields Cemetery, Loreta, Sauk, Wisconsin. & George Nieman all with a Loganville, R.1 address. Name Variation Cecelia K. Hutter was also known as Celia. Married Name 14 April 1920 As of 14 April 1920,her married name was Nieman. Married Name 14 April 1920 As of 14 April 1920,her married name was Niemann. 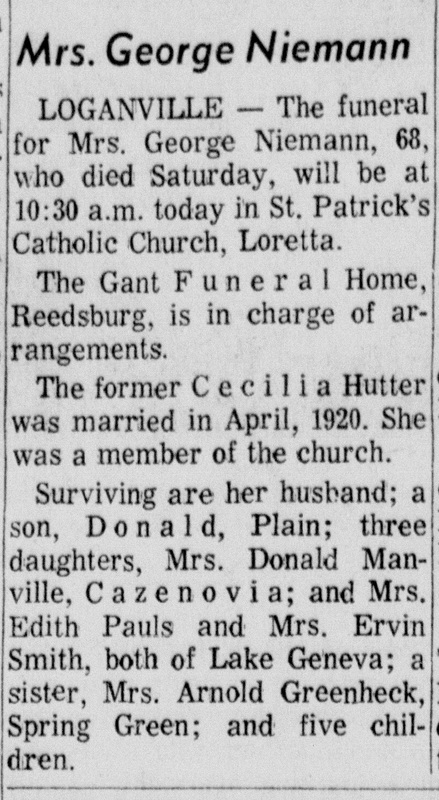 Cecelia K. Hutter was born at Wisconsin in 1902. Cecelia K. Hutter married George Arthur Niemann, son of Carl Fred Johann Niemann and Antoinette Anna Tobias, on 14 April 1920 at Loreto, Sauk, Wisconsin, by Rev Father John F Shanaghy; George Niemann and Cecelia Hutter marriage announcement. 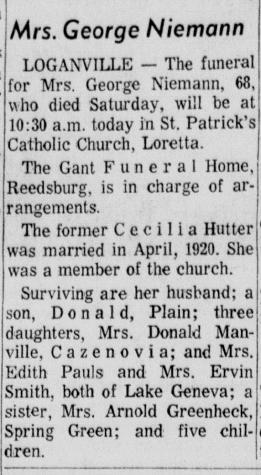 Cecelia K. Hutter died on 1 May 1971 at Madison, Dane, Wisconsin, Mrs George Niemann (Cecilia Hutter) obituary. On 29 July 1923 Mr. and Mrs. J. Zick of Denzin and Geo. Nieman and family were guests Mr. and Mrs. C. F. Nieman Sunday. On 2 January 1924 Mr. and Mrs. John Zick party announcement. 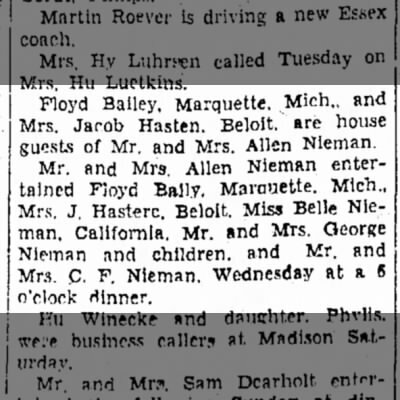 On 30 October 1929 Floyd Bailey, Marquette, Mich., and Mrs. Jacob Hasten, Beloit, are house guests of Mr. and Mrs. Allen Nieman. 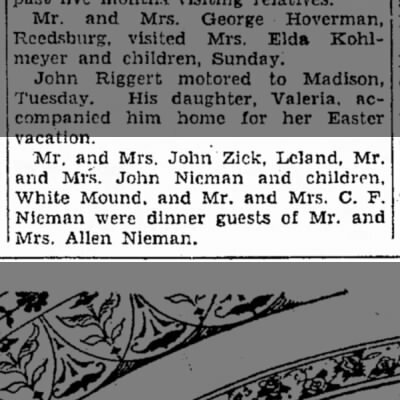 Mr. and Mrs. Allen Nieman entertained Floyd Baily, Marquette, Mich., Mrs. J. Hastere, Beloit, Miss Belle Nieman, California, Mr. and Mrs. George Nieman and children, and Mr. and Mrs. C. F. Nieman, Wednesday at a 6 o'clock dinner. 30 Oct 1929. 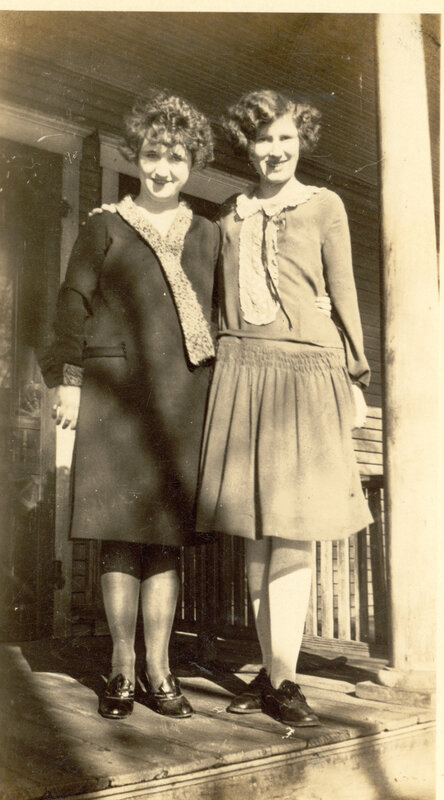 Cecelia K. Hutter was educated in 1940 at through 8th grade. [S243] U.S. Federal Census 1920 U.S. Federal Census, by Ancestry.com, Year: 1920;Census Place: Franklin, Sauk, Wisconsin; Roll T625_2015; Page: 2A; Enumeration District: 164; Image: 67. Name Variation Gertrude Belle Bailey was also known as Trudie. 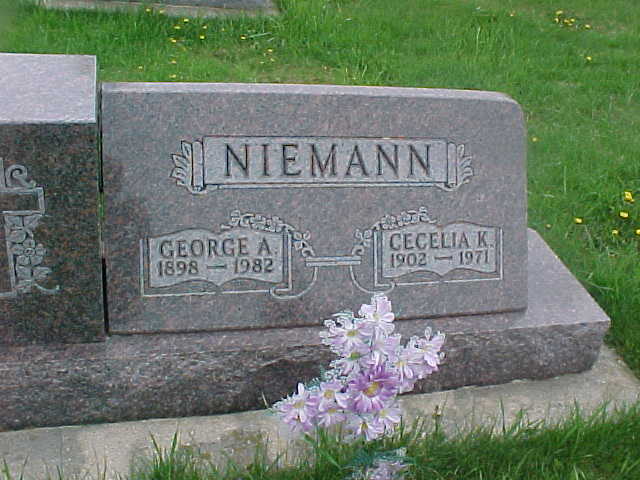 Married Name 25 July 1927 As of 25 July 1927,her married name was Niemann. Married Name 25 July 1927 As of 25 July 1927,her married name was Nieman. Gertrude Belle Bailey was born at Baraboo, Sauk, Wisconsin, on 8 May 1900. Gertrude Belle Bailey married Allen Albert Niemann, son of Carl Fred Johann Niemann and Antoinette Anna Tobias, on 25 July 1927 at Sturgeon Bay, Door, Wisconsin. Gertrude Belle Bailey died on 4 March 1976 at Green Bay, Brown, Wisconsin, at age 75. On 6 April 1928 Mr. and Mrs. John Zick, Leland, Mr. and Mrs. John Nieman and children, White Mound, and Mr. and Mrs. C. F. Nieman were dinner guests of Mr. and Mrs. Allen Nieman. (Madison Capital Times April 6, 1928). On 30 October 1929 Floyd Bailey, Marquette, Mich., and Mrs. Jacob Hasten, Beloit, are house guests of Mr. and Mrs. Allen Nieman. 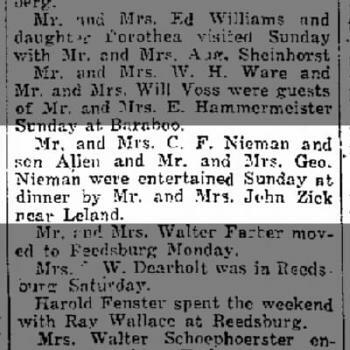 Mr. and Mrs. Allen Nieman entertained Floyd Baily, Marquette, Mich., Mrs. J. Hastere, Beloit, Miss Belle Nieman, California, Mr. and Mrs. George Nieman and children, and Mr. and Mrs. C. F. Nieman, Wednesday at a 6 o'clock dinner. 30 Oct 1929. 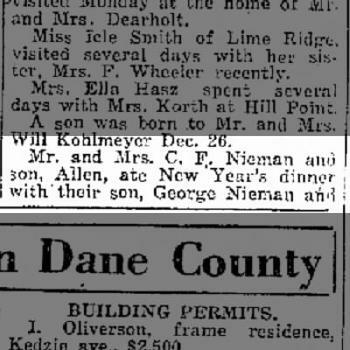 On 2 January 1930 at Franklin, Sauk, Wisconsin, Mr. and Mrs. C. F. Nieman, Mr. and Mrs. Allen Nieman and son, Darrell, and Audrey Sparling spent Christmas at the home of Mr. and Mrs. John Nieman. 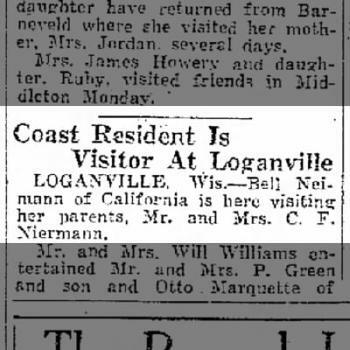 On 8 July 1930 Mrs. Allen Nieman and son and Audrey Sparling are spending two weeks with the former's mother at Beloit. 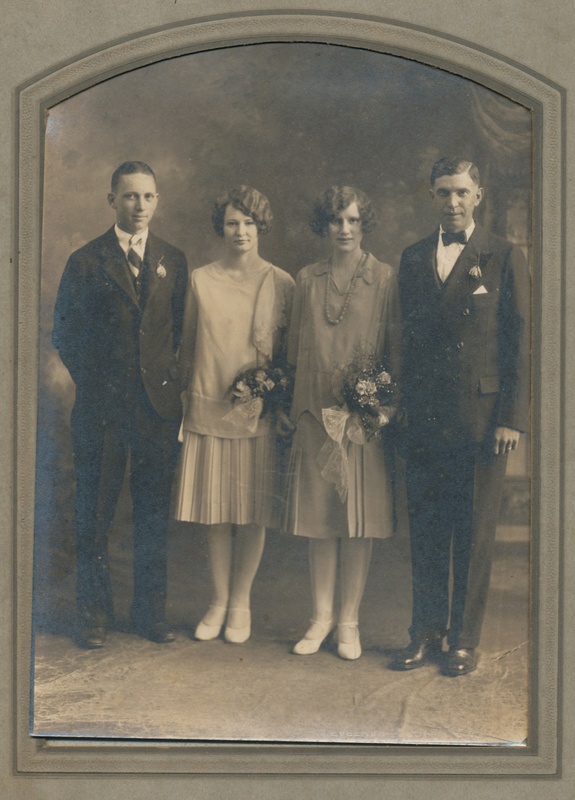 Circa 1931 4 generations - Lois Niemann, Gertrude Niemann, Harriet Foster, Darrell Niemann, Lora Bailey. 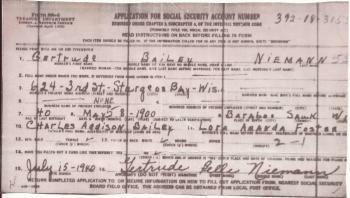 Gertrude Belle Bailey obtained US Social Security Card at Wisconsin; last residence Sturgeon Bay, Door, Wisconsin. In 1968 Allen and Gertrude Niemann and Violet Bailey Schattschneider 1968. She lived in November 1970 at Sturgeon Bay, Door, Wisconsin. Darrell Charles Niemann was born on 3 February 1929 at Loganville, Sauk, Wisconsin. He was the son of Allen Albert Niemann and Gertrude Belle Bailey. Darrell Charles Niemann and an unknown person were divorced on 21 January 1974 at Washington, Wisconsin. He married Geraldine Greiten, daughter of William Raymond Greiten and Gertrude Katherine Schmitt, on 15 February 1975 at Washington, Wisconsin. Darrell Charles Niemann died on 2 January 1981 at Fort Bend, Texas, at age 51 also reported as Houston, Harris County, Texas; also reported as January 1984. He was cremated on 22 January 1981 at Memorial Oaks Cemetery and Crematory, Houston, Texas. Darrell Charles Niemann obtained US Social Security Card at Wisconsin; last residence Missouri City, Fort Bend, Texas. On 2 January 1930 at Franklin, Sauk, Wisconsin, Mr. and Mrs. C. F. Nieman, Mr. and Mrs. Allen Nieman and son, Darrell, and Audrey Sparling spent Christmas at the home of Mr. and Mrs. John Nieman. 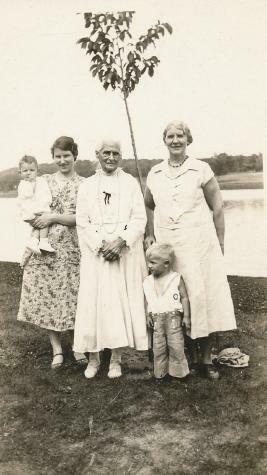 On 8 July 1930 Mrs. Allen Nieman and son and Audrey Sparling are spending two weeks with the former's mother at Beloit. 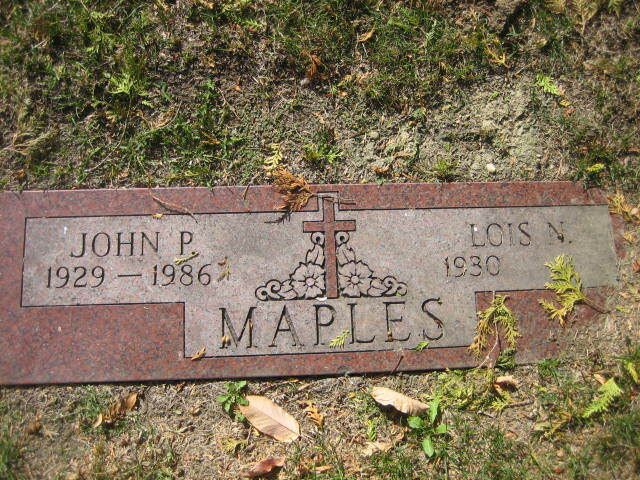 Married Name Her married name was Maples. 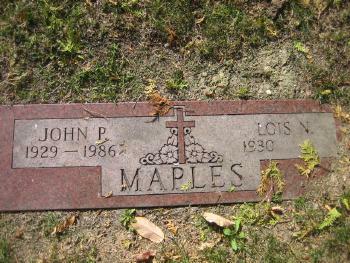 Lois Jean Niemann married John Patrick Maples, son of Frederick Arthur Maples and Eva Moore. Lois Jean Niemann was born on 1 December 1930 at Loganville, Sauk, Wisconsin. She was the daughter of Allen Albert Niemann and Gertrude Belle Bailey. 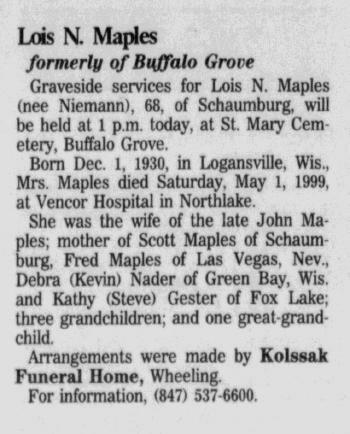 Lois Jean Niemann died on 1 May 1999 at age 68 Lois (Niemann) Maples obituary. She was buried after 1 May 1999 at Saint Marys Cemetery, Buffalo Grove, Lake, Illinois. Lois Jean Niemann obtained US Social Security Card at Wisconsin; last residence Schaumburg, Cook, Illinois. Last benefit Buffalo Grove, Lake, Illinois. Married Name circa 1921 As of circa 1921,her married name was Niemann. 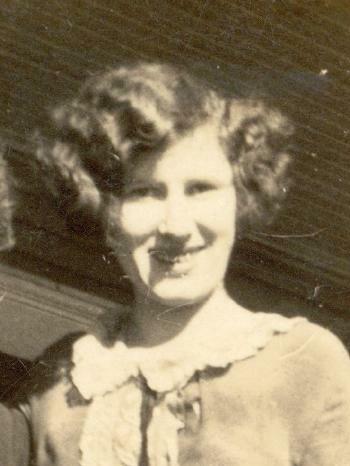 Sabra Lee Estes was born at Kentucky on 23 October 1900. She was the daughter of James Anderson Estes and Nancy Margaret Ballard. Sabra Lee Estes married Erhart Charles Niemann, son of Carl Fred Johann Niemann and Antoinette Anna Tobias, circa 1921. Sabra Lee Estes died on 20 October 1975 at Hernando, Florida, at age 74. She was buried after 20 October 1975 at Florida Hills Memorial Gardens, Spring Hill, Hernando, Florida. 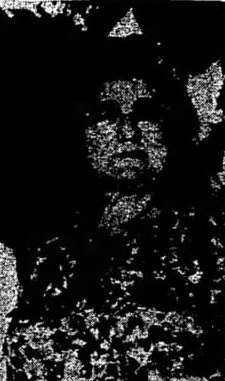 Photo of brothers George, Erhart, and Erhart's wife Sabra (Estes) Niemann. Sabra Lee Estes and Erhart Charles Niemann lived in 1941 at Lexington, Fayette, Kentucky. 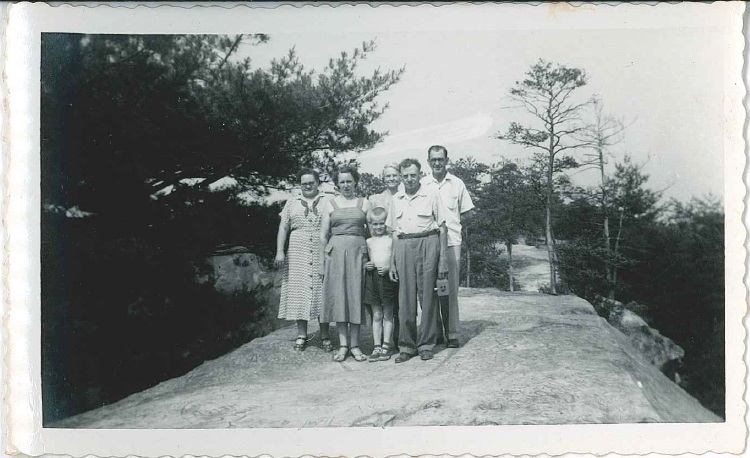 Photo of Ruth, Vera, Jerry, Sabra, John Sr, and Erhart Niemann from the 1950s. 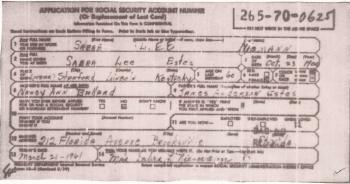 Sabra Lee Estes obtained US Social Security Card at Florida; last residence Florida. Married Name Her married name was Ball. Name Variation Eulee G. Niemann was also known as Ulee. Name Variation Eulee G. Niemann was also known as Euly. Eulee G. Niemann married (?) Ball. She was the daughter of Erhart Charles Niemann and Sabra Lee Estes. Eulee G. Niemann died on 20 July 1983 at Fayette, Kentucky, at age 55. Eulee G. Niemann obtained US Social Security Card at Kentucky; last residence Lexington, Fayette, Kentucky. [S372] Ancestry.com, Kentucky Birth Index, 1911-1999. Married Name before 1955 As of before 1955,her married name was Smith. Evelyn Caroll Niemann married Glenn Austin Smith, son of Leonard Anderson Smith and Lena Booth Riddle, before 1955. Evelyn Caroll Niemann died on 18 May 2016 at Friendswood, Harris, Texas, at age 81 Evelyn Carroll (Niemann) Smith swung open the pearly gates and ran into the arms of Jesus on May 18, 2016, at age 81. She was born July 4, 1934, to Erhart Charles Niemann and Sabra Estes Niemann in Lexington, Ky. She was an adored wife, mother and friend to all who knew her. Evelyn was raised in London, Ky., where she married her husband of 49 years, Glenn Austin Smith. They moved to Texas, raised their family of four in Austin, then returned to Frankfort, Ky., before returning to Clear Lake. She was a former member of University Baptist Church and was involved in the Clear Lake Christian Women’s Club. While living in Kentucky, she was a member of Graefenburg Baptist Church. Evelyn loved the Lord Jesus, she loved life, she loved music, she loved bright colors, she was known for being a snappy dresser, and she loved people. Those who were around her were made to feel like family, not just friends. She was a gracious and giving lady. Evelyn was preceded in death by her parents and her husband Glenn. She is survived by four children, son Mark Smith and wife D’Ann of Kansas City, Mo; son, Ron Smith of Lexington, Ky; daughter, Denise Smith Wright and husband Bobby of Friendswood, Texas; and daughter, Deborah Smith Wingate and husband Tommy of Frankfort, Ky. She also was blessed with 14 grandchildren and 12 great-grandchildren. Services will be 1 p.m. Monday at LeCompte Johnson Taylor Funeral Home. Visitation will be noon until the time of service. Interment will be at Sunset Memorial Gardens. She was buried after 18 May 2016 at Sunset Memorial Gardens and Mausoleum, Versailles, Woodford, Kentucky. Evelyn Caroll Niemann lived in November 2011 at 15927 Manor Square Dr, Houston, Texas. She lived in March 2012 at Frankfort, Franklin, Kentucky. Name Variation Margaret F. DeCamp was also known as Maggie. Married Name circa 1911 As of circa 1911,her married name was Mount. 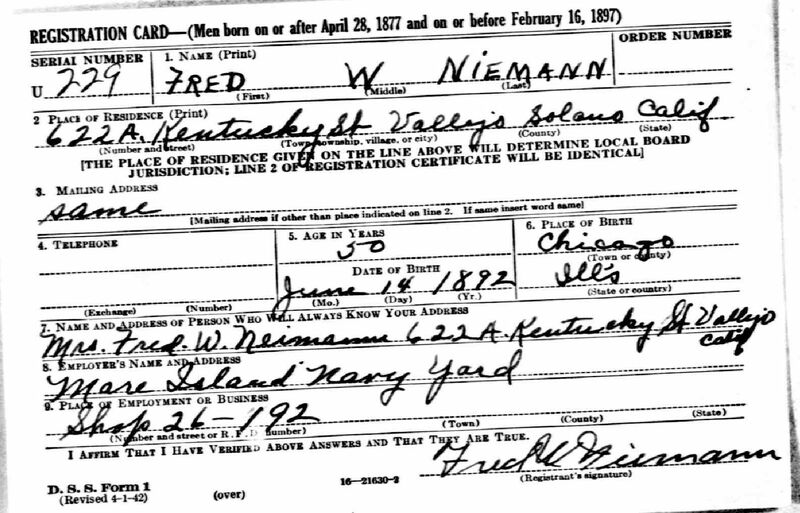 Married Name 23 August 1916 As of 23 August 1916,her married name was Niemann. Margaret F. DeCamp was born on 26 May 1895 at Iowa. She was the daughter of Silas Augustus DeCamp and Lavinia Elizabeth Anderson. Margaret F. DeCamp married (?) Mount circa 1911. Margaret F. DeCamp and (?) Mount were divorced before 1915. Margaret F. DeCamp married Fred Walter Niemann, son of Carl Fred Johann Niemann and Antoinette Anna Tobias, on 23 August 1916 at 1st marriage for him; 2nd for her, Redfield, Dallas, Iowa, marriage record. Margaret F. DeCamp died on 20 August 1969 at San Bernardino, California, at age 74 Mrs Margaret (DeCamp) Niemann obituary; Memorial of Margaret DeCamp Niemann, past president of WWI Veterans Auxiliary. She was buried after 20 August 1969 at Hillside Memorial Park, Redlands, San Bernardino, California. 1 June 1905 Redfield, Dallas, Iowa Margaret F. DeCamp appeared on the census of 1 June 1905 in the household of Silas Augustus DeCamp at Redfield, Dallas, Iowa. 1915 Redfield, Dallas, Iowa Margaret F. DeCamp appeared on the census of 1915 at Redfield, Dallas, Iowa. In August 1930 at Iowa Mr and Mrs Fred Niemann, son Eugene and Mrs S A DeCamp visited Mr and Mrs Roscoe Simons. Margaret F. DeCamp was educated in 1940 completed four years of high school. 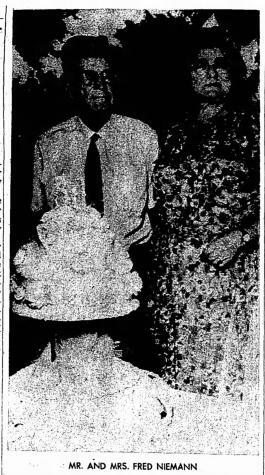 On 23 August 1966 at California Fred and Margaret Decamp Niemann 50th wedding annivesary article 26 Aug 1966 Redlands Daily Facts (Redlands, CA). [S245] U.S. Federal Census 1900 U.S. Federal Census, by Ancestry.com, Year: 1900; Census Place: Liberty, Marion, Iowa; Roll T623_447; Page: 9A; Enumeration District: 50. [S244] U.S. Federal Census 1910 U.S. Federal Census, by Ancestry.com, Year: 1910; Census Place: Union, Dallas, Iowa; Roll T624_399; Page: 2B; Enumeration District: 18; Image: 923. Name Variation Eugene Clarke Niemann was also known as Nieman. Name Variation Eugene Clarke Niemann was also known as Mount. Eugene Clarke Niemann was born on 13 May 1912 at Redfield, Dallas, Iowa, also reported as Redmond. He was the son of Fred Walter Niemann and Margaret F. DeCamp. Eugene Clarke Niemann witnessed the burial of Margaret Frances Anderson after 19 August 1934 at Iowa; Funeral of Mrs Roscoe Simons (Margaret Frances Anderson). Eugene Clarke Niemann married Annie Laura Owen, daughter of James Walter Owen and Mary Elizabeth Rickman, before 1940. 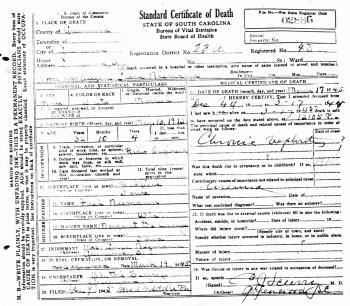 Eugene Clarke Niemann died on 17 March 1945 at Greenwood, South Carolina, at age 32. He was buried on 19 March 1945 at Edgewood Cemetery, Greenwood, Greenwood, South Carolina. 1915 Redfield, Dallas, Iowa Eugene Clarke Niemann appeared on the census of 1915 in the household of Margaret F. DeCamp at Redfield, Dallas, Iowa. Had only one arm. Eugene Clarke Niemann was a radio announcer. In August 1930 at Iowa Mr and Mrs Fred Niemann, son Eugene and Mrs S A DeCamp visited Mr and Mrs Roscoe Simons. He lived in 1935 at rural, Dallas, Iowa. He was a wireless operator at local shipping in 1940. He was a radio engineer in 1945. [S243] U.S. Federal Census 1920 U.S. Federal Census, by Ancestry.com, Year: 1920;Census Place: Redfield, Dallas, Iowa; Roll 31109_4300688; Page: 5B; Enumeration District: 18; Image: 433. [S373] U.S. Federal Census 1940 U.S. Federal Census, by Ancestry.com, Year: 1940; Census Place: Port Arthur, Jefferson, Texas; Roll: T627_4079; Page: 4A; Enumeration District: 123-101. 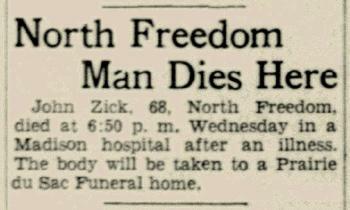 Name Variation John F. Zick was also known as John T.
John F. Zick was born on 25 November 1866 at Sauk, Wisconsin. He was the son of Theodor Ludwig Zick and Friederike Schultz. John F. Zick married Caroline Lydia Denzer, daughter of Heinrich William Denzer and Louisa F. Jede, on 13 December 1892 at Sauk, Wisconsin. John F. Zick married Minna Selma Mellenthin, daughter of Carl Friedrich Mellenthin and Anna Trueb, circa 1903 second marriage for John. First for Mina. John F. Zick married Antoinette Niemann, daughter of Carl Fred Johann Niemann and Antoinette Anna Tobias, circa 1914. 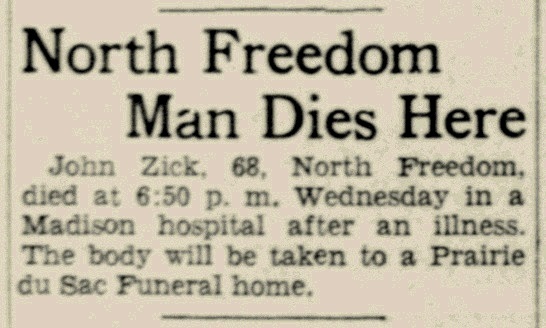 John F. Zick died on 7 August 1935 at Madison, Dane, Wisconsin, at age 68 John Zick obituary. In August 1925 Pearl and Arline Koenig are visiting in the home of their aunt and uncle, Mr. and Mrs. John Zick in Denzer. (Madison Wisconsin State Journal August 2, 1925). On 6 April 1928 Mr. and Mrs. John Zick, Leland, Mr. and Mrs. John Nieman and children, White Mound, and Mr. and Mrs. C. F. Nieman were dinner guests of Mr. and Mrs. Allen Nieman. (Madison Capital Times April 6, 1928). [S247] U.S. Federal Census 1870 U.S. Federal Census, by Ancestry.com, Page 21. Dwelling 147. [S245] U.S. Federal Census 1900 U.S. Federal Census, by Ancestry.com, ED137. Dwelling 124. [S364] Wisconsin State Census Wisconsin State Censuses, 1895 and 1905, by Ancestry.com, Dwelling 158. [S244] U.S. Federal Census 1910 U.S. Federal Census, by Ancestry.com, ED118. Dwelling 21. 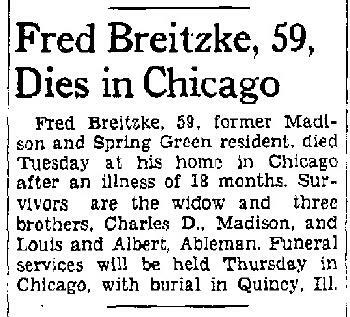 Name Variation Frederick Herman Breitzke was also known as Fred Herman. 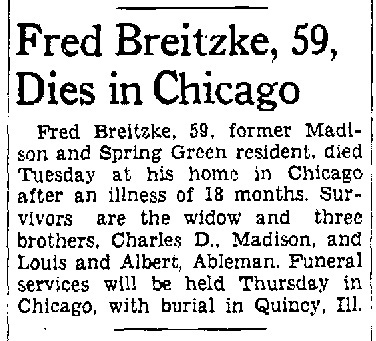 Frederick Herman Breitzke was born on 11 April 1877 at Wisconsin also reported as Apr 1878. 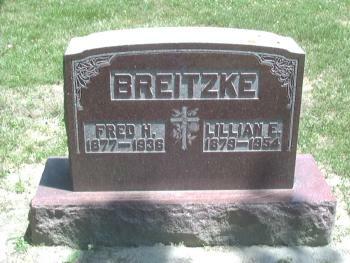 He was the son of William F. Breitzke and Henrietta Augusta Lange. Frederick Herman Breitzke married Lillian E. Prieskorn, daughter of Charles Prieskorn and Louise Carolina Adolphina Marie Arndt, in 1904 at Adams, Illinois. He was buried after 20 October 1936 at Greenmount Cemetery, Quincy, Adams, Illinois. 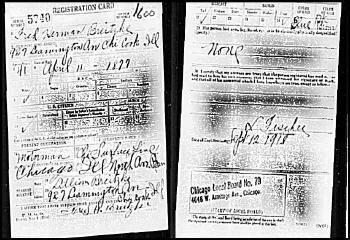 On 12 September 1918 at Chicago City, Cook, Illinois, World War I Draft Registration. 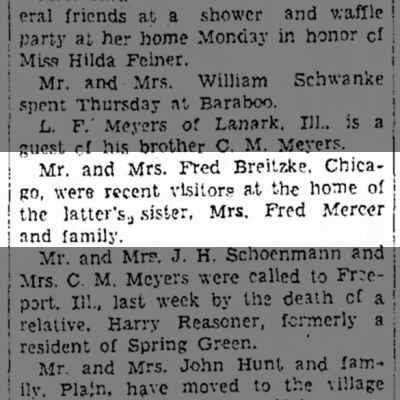 On 26 November 1930 Mr and Mrs Fred Breitzke, Chicago, were recent visitors at the home of the latter's sister, Mrs Fred Mercer and family (article). 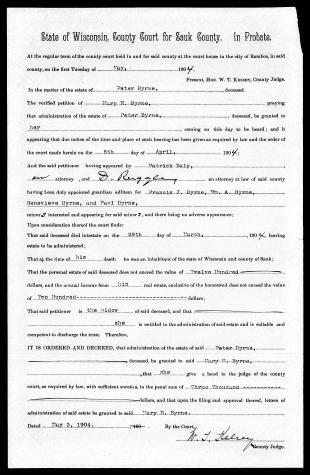 [S238] Illinois Death Records, by Illinois, certificate 6030315. [S245] U.S. Federal Census 1900 U.S. Federal Census, by Ancestry.com, ED132. Dwelling 245. Name Variation Patrick Henry Kaney Jr. was also known as P. H.
Patrick Henry Kaney Jr. was born on 25 May 1860 at Sandusky, Washington Twp, Sauk, Wisconsin. Patrick Henry Kaney Jr. married Margaret Ann Kane, daughter of Henry Kane and Mary McCollon, on 7 January 1885 at St. Margaret's Catholic Church, Kimball, Brule, South Dakota. Patrick Henry Kaney Jr. died on 10 July 1927 at Charles Mix, South Dakota, at age 67 Patrick H. Kaney was born May 25th, 1860 at Sandusky, Wisconsin. He came to Dakota in 1880 and homesteaded in 1885, at Kimball, S.D. where he was married the same year to Margaret Kane and where he lived until coming to Wagner in 1904. He died July 10, 1927 and funeral services were held at St. John's church in Wagner, July 13, 1927. He had four sisters and three brothers, all surviving him except one sister. They are James Kaney, Joseph Kaney of Richland Center, Wisconsin; John S. Kaney of Milwaukee, and Sr. M. Wilfifred, Sr. M. Mecktilde, Sr. Ceclia Urban and Sr. Rose Patrick, all sisters of a convent in Brooklyn, New York. Joseph Kaney and John S. Kaney were here to the funeral. Mr. and Mrs. Pl. H. Kaney had seven children: Mrs. Fred Stancer, Mrs. E.D. Sadler, Mrs. Chas. Hrdlicka, Mrs. Frank Silvis, Mrs. W.B.Taylor and Hannah and Henry Kaney. All are living except Mrs. W. B. Taylor who passed away two years ago. 1905 South Dakota He appeared on the census of 1905 at South Dakota wife and son Henry aren't included in the census index. 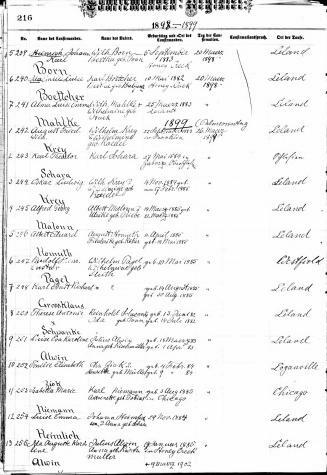 [S246] U.S. Federal Census 1880 U.S. Federal Census, by Ancestry.com, NA Film Number T9-1421. Page 10C. ED66. Dwelling 151. [S217] Adeline S. Gnirk, unknown short title, Pg 274. [S261] Land Office Records Land Patent Record, by Bureau of Land Management, Accession/Serial #: SDMTAA 032878 BLM Serial #: SDMTAA 032878.